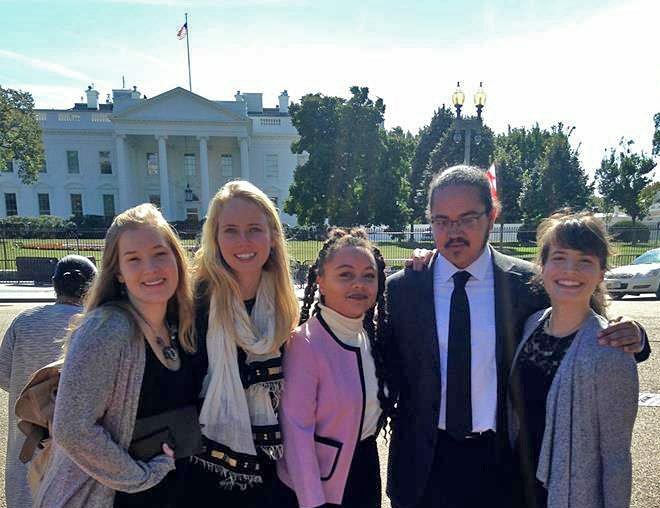 Five Linehan Artist Scholars from UMBC visited the White House last week to participate in a workshop led by William Allman, chief White House curator. Adan Rodriguez ‘17, film; Justyna Kurbiel ‘18, animation; Megan Clelan ‘19, graphic design; Sarah Miller ‘17, photography and interdisciplinary studies; and Emily Eaglin ‘17, video, attended the special event, accompanied by Doug Hamby, associate professor of dance and director of the Linehan Artist Scholars program. Linehan Artist Scholars , l-r: Justyna Kurbiel, Sarah Miller, Emily Eaglin, Adan Rodriguez, and Megan Clelan. The workshop was centered around a recently acquired painting by Alma Woodsey Thomas, an African American Expressionist painter and art educator from Washington D.C. (1891-1978). The students learned about Thomas’s painting, now on display in the White House’s Old Family Dining Room, and heard remarks from First Lady Michelle Obama on the significance of Thomas’s work. They also learned from Allman about the broader history of the White House art collection, how the pieces of art were selected and acquired, and how the president and first lady select art to display in the living area of the White House. Following the official remarks, the Linehan Scholars were invited to view and discuss the artwork with art experts on the second floor of the White House. During another White House event in the same week, Kafui Dzirasa ‘01, chemical engineering, served on a neuroscience panel alongside President Barack Obama. The White House Frontiers Conference was held at Carnegie Mellon University and focused on advances in neuroscience and progress made by the Brain Research through Advancing Innovative Neurotechnologies (BRAIN) and Precision Medicine Initiatives. The BRAIN Initiative supports research to advance the understanding of the human brain by developing technologies that show how individual cells and intricate circuits interact. “I think the big opportunity is for us to begin to think of the brain as an engineered system,” said Dzirasa, now a prominent researcher at Duke University, sitting beside President Obama. He went on to describe the incredible number of steps that take place within fractions of a millisecond every time the brain receives, processes, and responds to input, which can easily be interrupted in conditions from Alzheimer’s to autism. Even when discussing doctors’ and researchers’ “common enemy” of disease, Dzirasa focused on the positive. “The reason I’m optimistic is because I fundamentally believe that there is a seven year old sitting in a classroom somewhere that will take all of the investments and all of the work that we’ve made and will transform things for my family,” he said. Watch the full video of the White House Frontiers Conference panel on the White House website. Images: (1) A view from the White House, photo by Adan Rodriguez; (2) Linehan Artist Scholars in front of the White House, photo courtesy Doug Hamby.